Upon entering the Nyeseng region, everything changes. In this upper part of the Manang District, the trail begins to gain altitude, and with it, the flora and fauna change. Trees thin out while buffalo are replaced with more hardy and climatically-appropriate yak. Fields here are allocated for alpine staples such as wheat, barley and buckwheat, the three of which are much better represented in the local cuisine than in food elsewhere in Nepal. This is a harsh environment, and vital adaptations are clearly visible in everything at lives here. The track here changes from being at the bottom of the valley to running high up the side of it. The climb is strenuous at times but the views are consistently stunning. Around very corner is a screensaver-worthy vista, and indeed the photos in this post are just a fraction of the spontaneous photos I took while trekking. The ascent starts around the town of Upper Pisang, a hillside hamlet of imposing stone houses. Each building has a flagpole on its roof in addition to the typical prayer flags found elsewhere. After passing by several mani walls, the track climbs extremely steeply. A seemingly-infinite number of switchbacks isn’t enough to lessen the severity of the steepness, and the false crests pose an additional psychological challenge. Ghyaru (left) is a gorgeous and often-overlooked town with amazing views. The visible path at the bottom of the valley is the only way to get there, so prepare for sore legs. After feeling our legs burn for what felt like an eternity, we decided to spend the night in the tiny village of Ghyaru. Only one teahouse was open, run by an aunty-nephew duo filling in for the matriarch of the family who had gone to Kathmandu to do shopping. In this cosy little village we ate steaming thukpa soup by an open fire while the family fried the ubiquitous Tibetan bread which had become a staple of the trail. That night it snowed, not just outside but through the ceiling of our teahouse as well. But despite this we managed to stay warm by the fire. Ghyaru has the added benefit of being at a relatively high altitude—this adds an additional night of acclimatisation before you cross the Thorong La Pass. I’ll talk more about acclimatisation in a bit. A mani wall in Ghyaru with the Annapurna Massif in the background. The route out of Ghyaru. As the sun crept over the mountaintops the next morning, cattle began to sunbake in formation. The snow first glistened before melting slightly as the sun rose higher. We continued trekking high up on the side of the valley, passing more prayer wheels and a ruined dzong. Ghale Dzong was used by the fort’s namesake family when it controlled much of the valley over 800 years ago. At present it simply compliments the stunning views from the trail and gives the eagles something to circle around. View across the Manang Valley, including the region’s airport. The trail passes through Ngawal before levelling out on a plateau. Stray dogs are a recurring theme on this trek, and during this stretch especially they will walk alongside you at the same pace, stopping as you do to take in the beautiful scenery. As you leave one dog’s boundary, it will seemingly hand you over to the next dog, and so on. One of the many dogs who will follow you and wait as you stop to take in the scenery. We slowly descended back to the valley floor, passing though several villages of just a few buildings. We were now back at the river until the end of the valley, where Manang sits atop another plateau. Manang is one of the largest and most important towns on the trek. Here travellers must spend at least two nights to acclimatise before crossing the formidable Thorong La pass. An additional night spent elsewhere between Manang and the pass also contributes towards the acclimatisation process, and those wishing to be extra safe against altitude sickness should also spend a night in either Ghyaru or Ngawal before Manang as they are at even higher elevations. It helps that these towns are particularly special regardless of health benefits. Don’t forget to look up! The ceiling of stupa in Manang. For some reason, this Himalayan outpost has a distinctly wild-west feel about it. Perhaps it’s the wide dirt road where locals tie up their horses. Flanking this road are some of the biggest teahouses of the trek, resembling western saloons in an alternate universe where -20° C weather is the norm. Because so many tourists are forced to spend a full day here, there are additional facilities not found elsewhere in the region, such as larger shops, bakeries, a museum and even a small, seasonal cinema. Ever had a yak burger? Now’s your chance. But the real charm lies in the old town, towards the back of the main street. Here, the same stone buildings with beautiful wooden fittings form the same tight laneways as elsewhere, just on a larger scale. Even further back are the ubiquitous terraced fields where hardy grains are cultivated. They are the last such fields until after you cross Thorong La pass. Looking back towards Manang. By this point the land has become totally barren. In Manang you will inevitably meet people who turned back from the pass, or even the basecamp, because of altitude sickness. This is a real danger and it is important that you spend at least three nights acclimatising (we spent five: one in Ghyaru, two in Manang, one in Ledar and one at the Throng La high camp). However some people will simply use idea of altitude sickness as an excuse to turn back despite not actually showing symptoms. One guy at our almost-empty teahouse in Manang kept changing his story between altitude sickness, food poisoning and the flu. It’s possible he was actually sick, but he seemed fine and more importantly nothing in his web of stories added up, especially after we crossed the pass ourselves. Even in winter, the pass is perfectly crossable (assuming there hasn’t been an avalanche) and very few trekkers experience signs of altitude sickness. If someone choses to turn back for whatever reason, that’s their decision and perfectly OK—just don’t buy into any tales of altitude sickness from people who clearly didn’t trek that high up. After Manang, the only way is up—both north and at an increased eased elevation. The trail once again becomes a bit strenuous at it enters the Jharsang Khola valley. This is really remote country. The land is barren and more rugged than ever. Just a few tiny villages dot the trail from here on. But somewhat remarkably, you’ll still see cattle grazing. It’s all about those high-altitude adaptations. Eventually the land becomes too barren for even a trail to exist; landslides become a real threat and the diagonal ground becomes quite powdery. I can confirm “step gently” is sound advice. Finally, we reached the base of the Thorong La pass. There are two* options here: to stay at the low camp, which is also home to the world’s highest-altitude bakery, or to climb an extremely steep and rocky slope to the high camp. Both camps have decent facilities as almost every trekker must spend the night at either one of them. The decision is really whether your legs are too destroyed to do the hardest climb of the whole trek at the end of a long day, or whether you don’t want to have to do the same extremely difficult limb first thing in the morning. We were of the latter opinion, do as the sun began to do down, we went up. 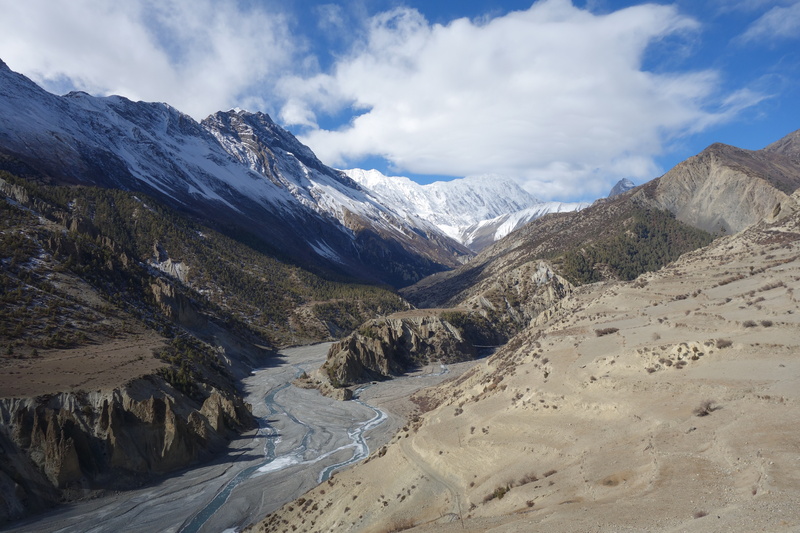 *There is a third option for the truly crazy: not to spend the night at either camp, and instead depart from Manang and cross Thorong La pass in the same day. You need to be super fast and very fit to be able to do this (acclimatisation is less important is you’re not spending the night near the pass), but it is possible, having met two guys who did just that! The route to Thorng La high camp. There’s no real trail, and it’s extremely steep. The next day was what we’d all been waiting for. We would finally cross Thorong La pass. At an elevation of 5,416 metres, it becomes very difficult to breathe for most trekkers. I had acclimatised better than the rest of my family, who were stopping and panting for much of the way, and even I found myself short of breath. The only way to soldier on is to walk at a controlled speed and to control your breathing so that each breath is slow and deep. Definitely don’t panic, and if you do find yourself breathing too fast, stop moving completely until you’ve caught your breath again. But the feeling of being on top of the world is reason to continue on. For the first time on the trek, you are no longer looking up at the mountain tops. Here on the pass, they are your peers. Crossing the pass does feel arduous though, as there are numerous false peaks which tease most short-of-breath trekkers. The feeling when you finally see the real peak on the horizon is indescribable. Reaching the peak was a huge feat. My brother was 14, my mum wasn’t particularly fit, my dad had a seriously torn shoulder muscle and was in a sling and carrying his backpack on just one shoulder for the whole trek. I was the only one who looked like most of the other trekkers we met, and I found the trek challenging. So the fact we all made it as a family was incredible, but also proof that others can do it too even if they don’t particularly see themselves as expert trekkers. On top of that it was winter! The weather was around -25° C at its worst, there was snow everywhere, and we hadn’t had running water in a week because all the pipes were frozen. This was supposedly the season for avalanches and whiteouts, both of which make the pass uncrossable for many days. Yet here we were, literally against all odds, without a single hiccup. Don’t listen to those who monger fear about trekking, rather consider the risks and take appropriate precautions. Despite what many people say, you won’t need crampons to cross the pass. However, some people might need climbing polls on the way down, as my mum did. The decent from Thorong La pass to Muktinath is insane. You are so high up that the bottom of the valley is largely obscured by clouds. Even when you pass below the clouds, the villages are so far away that you can barely see them. So imagine the toll that this kind of this kind of descent takes on your knees. Pretty much all trekkers at Muktinath, the next major town after the pass, hobble around all night long after their descent from Thoong La. For many, it’s harder and slower to go down that it was to go up, and you should factor this as being the longest part of the day. Trekking this far in the Annapurna Circuirt allowed us to witness a variety of beautiful lanscapes changing with the altitude. The Himalayan cultures of the region (largely Tibetan) make the trek even more worthwhile owing to the beautiful villages and delicious food. The third element, the sense of physical exertion and subsequent achievement, were perhaps most important to the rest of my family. It’s a long way up in cold weather and thin air. But we made it, and we had the time of our lives. The remainder of the Annapurna Circuit is the least interesting part, so it won’t get its own post. Much of the trail has been ruined by the construction of a new road; and who comes to the Himalayas to walk alongside loud trucks? Of course such developments can be beneficial to the communities of this area, particularly in bringing in supplies more easily. Just don’t expect it to be as beautiful as the previous valleys. Mukinath has an interesting temple complex that’s quite significant for Buddhists and Hindus alike. Jomsom is horrible, and the noise from the wind and the river are enough to keep you up at night. Tatopani is a gorgeous little town, and the hot springs there are a great way to recover from the trek. But another good way to recover would be to go partying in Pokhara! Yaks grazing near high up on the trail. The view down from Thorong La pass. Cattle sunbaking in the morning near Ghyaru. Cattle inside the village of Upper Pisang. Upper Pisang is perched at a beautiful spot. Some of the river crossings are more precarious than others. Stupas and mountains, a common sight along the trail. Looking out over the Manang Valley. The most remote tea stall in the world? Located somewhere between Manang and Throng La pass. Communist graffiti on a remote suspension bridge. The hammer and sickle high in the Himalayas. A typical view along the trail. Things are a bit more lush at the floor of the Manang Valley. A mani wall in Upper Pisang. Taps are permanently turned on to stop them freezing over… which sometimes yields interesting results. …and a horse near Ghyaru licking a frozen waterfall. Sanskrit mantras engraved on a mani stone. The engravings on mani stones have stood up well to the elements. Ghyaru, possibly my favourite little town from the whole trek. Looking down towards the tiny town of Chulu. At around 5,000m high, you begin to see the mountain tops at eye-level. Sorry, I have to disagree. After 14 treks in Nepal (including 4 times over Thorung La), I’ve seen MANY trekkers suffering from altitude sickness (some seriously; one dying). Not to be taken lightly (and yes, one definitely can get altitude illness below/before Manang). Region below Muktinath is actually quite stunning (except Jomsom), and it is possible to avoid the road in most places (see NATT book). Hmmm maybe I under-represented the real danger of altitude sickness, but my point wasn’t to talk about the sickness itself but rather the fear mongering which turns otherwise healthy people off trekking for purely psychological reasons. My mum was almost ready to turn back from Thorong La after hearing complete nonsense from others who weren’t confident enough to cross the pass themselves. I would hate for anyone else to turn back for similar reasons. Awful to hear that you’ve known someone who’s passed away from it. Can’t imagine what that would be like in either position. I appreciate your feedback on both posts, David. I’ve clearly missed some things and made a few careless mistakes when writing. This is amazing! Such warriors all of you really are. I commend the fact that you kept going despite the discouragement from that particular person. There are indeed times when we have to listen to our body, but sometimes what we think our body trying to say something is basically our mind trying to pay tricks on us. This reminds me of the trip I took to Mount Rinjani in Lombok more than five years ago. A guy at the base camp told me and my friend that our biggest obstacles would be ourselves. He said there were much older people who completed the trek despite not believing at first that they could do it. Cheers Bama! That’s exactly it… looking at others who’ve completed the trek is a great way to overcome any kind of self-doubt. For much of the circuit we walked alongside frail, elderly women carrying extremely heavy loads over long distances with only basic shoes. After seeing them day in, day out, I knew the only things that could possibly stop me would be myself. Yeah, there is a LOT of worrying (and fear mongering) the days before the pass (and especially at Phedi). For first timers, it seems the only thing on their mind. (It gets especially bad if one sees it has snowed several days before). Funny thing is, we had fresh snow on our last Thorung La crossing: in August! By the way Zac, I have to complement you on the two blog posts. Minor typos don’t take away from it. And some really (!) great photos. Did you happen to eat some naan bread or drink Chai tea while crossing thorung la pass? I wonder if they have atm machines up there and if so better remember your pin number!